The first beta of iOS 12 just released today. As iOS 12 focuses more on improving performance and addressing issues than major new features, Apple fans are wondering if they should upgrade to iOS 12 or not. Check this post and an early adopter will tell you. Part 1: What Can You Benifit from iOS 12 Update? Part 2: What Are the iOS 12 Deficiencies That Swayed Your Decision? Part 3: Conclusion: Upgrade to iOS 12 Or Not? What Can You Benifit from iOS 12 Update? iOS 12 is a benefit for older iDevices. Traditionally, new iOS systems won't play nice with older devices, in the way of slowing down the device or eliminate the support for older phones. Instead, iOS 12 is focused to improve performance on even older iPhone iPad. After you update to iOS 12 on older devices, you can experience faster performance in iOS 12 vs iOS 11: 40% faster launching apps, 50% faster displaying keyboard and 70% faster taking photos. According to personal experience, iOS 12 is amazingly faster when running most apps on my iPhone 7 Plus. If you want the maximum performance lift, upgrade iPhone iPad to iOS 12. Last year has been tough for iOS. The iOS 11 was unusually and exceedingly buggy. With iOS 11, we had battery problems, Wi-Fi failures, apps crashes, performance issues, and various bugs. There are users considering iOS 11 as the worst iOS ever. To fix the mess in the previous version, iOS 12 has focused on bug fixes and performance improvements. From users feedbacks, iOS 12 has already fixed some bugs that long exist on iPhone running iOS 11. My early tests indicate that iOS 12 does offer significant improvements on the performance, stability, usability and bugginess. If you're plagued by problems caused by iOS 11, upgrading to iOS 12 can be your solution. 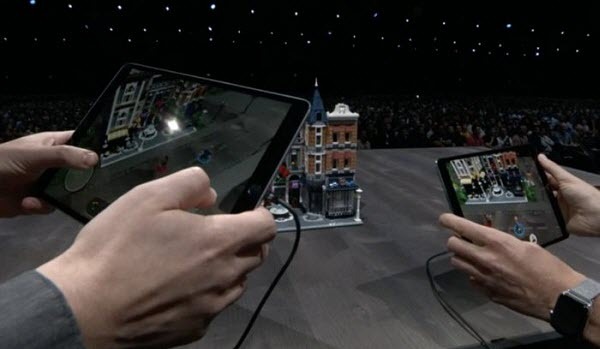 Augmented reality gets enhanced on iOS 12 with a new USDZ file format created by the company alongside Pixar for creating and sharing 3D Augmented Reality content in s single open file. All iOS and macOS devices, as well as many third-party apps from Adobe, Autodesk, etc will support this new format. iOS 12 takes advantage of its AR abilities in a new app called Measure. The new app is able to measure the objects or distances in front of you. ARKit 2.0 makes iOS 12 the widest platform for AR. After you upgrade to iOS 12, you will be able to access to shared experience. In other words, multiple users can view the same virtual objects from different devices. Companies including LEGO are using ARKit 2 to build multiplayer gaming. This feature is quite fun. Searching one specific picture from thousands others is a pain. But when you upgrade iPhone iPad to iOS 12, things get easier. Photos app in iOS 12 gets a big update. It automatically provides search suggestions based on the people, location and events. You can use multiple search terms at once. There is a new tab For You will recommend effects and filters you may want for your pictures. For You also offers a new sharing feature to suggest who to share the photo with. These new features make iOS 12 comparable to Google Photos. If you want to manage time smarter like Android P, don't hesitate on whether to update to iOS 12 or not, just do it. 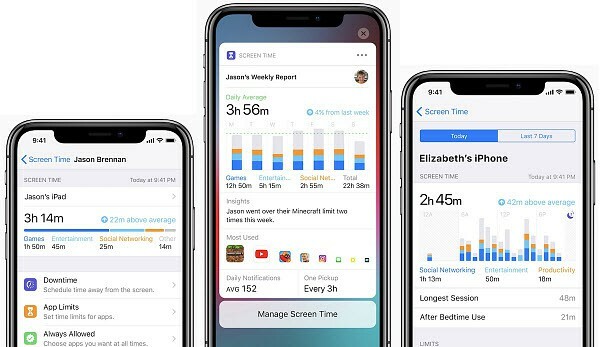 iOS 12 has a new feature called Screen Time, which will track and chart your device usage on individual apps. This feature can help users to schedule the amount of time per app, set the downtime and also bypass the restrictions you set via some feature called app limits. Screen Time is extremely useful for parents to limit the time their children can use the device. Apple upgrades Siri in iOS 12 to stack up against Amazon Alexa and Google Assistant. Siri in iOS 12 integrates with notifications and other third-party apps to create shortcuts for carrying out command faster. With the new app called Shortcuts, you can create single and custom reminders tailored for you to trigger the action. For example, you can customize it with a particular phrase or keyword to help you remember it, like "Hey Siri, it's movie time" to let Siri open the video app. Notifications on previous iOS 11.4, 11.3 and earlier are annoying and messy. But after you upgrade to iOS 12, you can enjoy improved the notifications experience. Apple takes a big step in notification management: support grouped notification in iOS 12. Notifications are grouped together and can be dismissed or interacted with from the same app in a single tap. Multiple notifications will show up in a stack to avoid missing any important messages. What Are the iOS 12 Deficiencies That Swayed Your Decision? Like always, as iOS 12 is in its early stage with the developer beta only, the beta version is not stable and a lot of bugs are waiting to be addressed. For example, there are many early adopters reporting "Can't connect to App Store" error. Other reported bugs include "Skype app may force close", " "Volume won't work", "Notification bage not working properly", "data lost after iOS 12 update" and various others. It's no big deal if the failure doesn't have any big effects to your life, but we can't tell if any huge ones are waiting. For example, iOS 12 Beta 7 update has been pulled owing to the performance bug. If you don't want to experience bugs like "iOS 12 update bricks iPhone", our suggestion is to wait until more feedbacks come out. At current stage, iOS 12 is under test. Namely, neither Apple nor developers will know what bugs will there be, not to mention how to fix them. When you update to iOS 12 and encounter any trouble with it, you can't get any existing help or support. You may find the solution on your own, or suffer the bug until an official fix releases. iPhone: iPhone X, iPhone 8, iPhone 8 Plus, iPhone 7, iPhone 7 Plus, iPhone 6s, iPhone 6s Plus, iPhone 6, iPhone 6 Plus, iPhone SE, iPhone 5s. iPad: 12.9-inch iPad Pro 2, 12.9-inch iPad Pro, 10.5-inch iPad Pro, 9.7-inch iPad Pro, iPad Air 2, iPad Air, iPad 5, iPad mini 4, iPad mini 3, iPad mini 2. Although it covers most iPhone iPad and iPod devices over the years, some older versions also fail to update to iOS 12. Still, we're normally sceptical about whether older devices like iPhone 5s/6 can actually cope with the greater processor demands presented by new software. Conclusion: Upgrade to iOS 12 Or Not? Certainly, you should upgrade to iOS 12, but not before iOS 12 official release. According to techradar, iOS 12 update release date is Sept 17, 2018, a week after the Apple's fall event. Then you're highly suggested to upgrade to iOS 12 to enjoy an overall faster performance, a great number of new features like ARKit 2, clever Siri suggestion, group facetime, animoji and memoji in iMessages, brand-new Photos app, digital wellbeing etc. If you'd like get a sneak peak of iOS 12 before Sept 17, you can update to beta version on your sub-subroutine iDevices to get rid of any data loss in the process. Once you decide to update, remenber to backup your iOS data before everything. This will keep your iOS data intact and safe for restoring after update. Before you upgrade iPhone iPad to iOS 12 from iOS 11.4, 11.3 or ealier, you will need this super-fast iPhone manager to backup and transfer bulk photos, music, video, iTunes purchases, ringtones, iBooks from iPhone to Mac/PC and vice versa. World's No.1 speed without any quality loss!